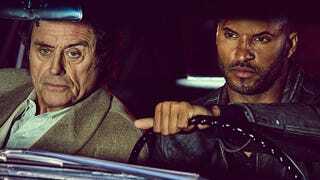 Ian McShane says American Gods' second season gets "back to the book"
Things have been fairly rocky for American Gods, which debuted its first season on Starz almost two years ago. Since then, the series–based on Neil Gaiman’s novel–has lost three showrunners and a couple of key stars, and yet somehow they managed to put a complete second season together. I think Season 2 is really a great way back to the book, which I thought we got away from in season one. Spectacular some of it was, and subversive and far out there as it was, we think we needed to get back to the line in the book, which is reuniting Shadow with his story, and his relationship with Laura, and Laura’s complicated relationship with Sweeney, and the character that you’ve become invested in needed exploring more. And I think the series two does that. Bring it together in a way and asking provocative questions of where do you go with the rest of the book if there’s a season three? Following the completion of the first season, showrunners Bryan Fuller and Michael Green departed the series over budgeting issues. They were replaced by Jesse Alexander, who left in the middle of production on the second season, leaving American Gods without a showrunner for the time being. As such, Gaiman was the only producer to appear on the TCA panel for the series, which lends credence to reports that Gaiman–despite his public statements to the contrary–has been clashing with showrunners. /Film has more details on the new characters and plot for the second season of American Gods, which premieres March 10 on Starz.